Download "Cooking at the Speed of light!" 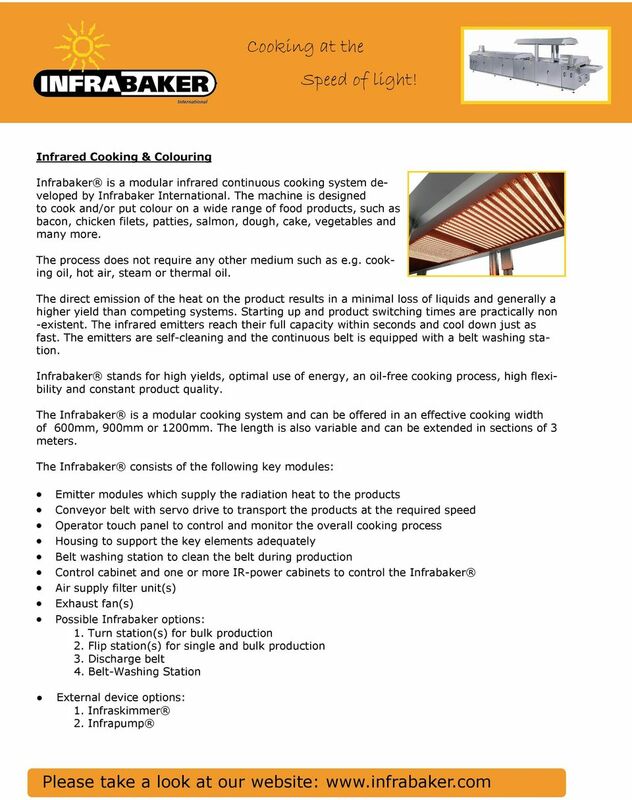 2 Why Infrabaker Cooking and/or colouring in one step Low energy consumption Cooking with only electricity No heat up and cool down times Constant quality Easy process Low maintenance and cleaning Modular system Constant Quality The touch panel controlled Infrabaker guarantees constant quality, is easy to operate and requires little specific knowledge for production and daily maintenance. Energy efficiënt Infrabaker uses its energy directly to heat up the product, there is no medium needed such as hot air, steam, oil or thermal oil. The heat up time and cool down time of an emitter is mere seconds. This results in an optimal use of the Infrabaker. The emitter banks are switched on sequentially by an infeed sensor. You only consume energy when there is product inside the Infrabaker. This results in favourable energy expenses per Kg of product. The possibility of very quick product changeover is another benefit of the Infrabaker emitters. Clean production The Infrabaker is housed in an aesthetic package. The Infrabaker system is enclosed in a neat package of doors and panels which shield operators from moving parts or high temperatures. Doors and panels can be opened and easily removed to gain maximal access for cleaning or maintenance activities. All surfaces and rims are designed in such a way they drain naturally and prevent standing water. Besides this the Infrabaker can be equipped with an integrated belt washer, which keeps the conveyor belt clean during production. Featuring double counter rotating motorized brushed rollers, a high pressure spray bar and a water heater. This all results in minimum cleaning time after production runs. Easy system Infrabaker requires little maintenance besides daily cleaning operations. Periodic checks and maintenance are indicated on the operator panel. 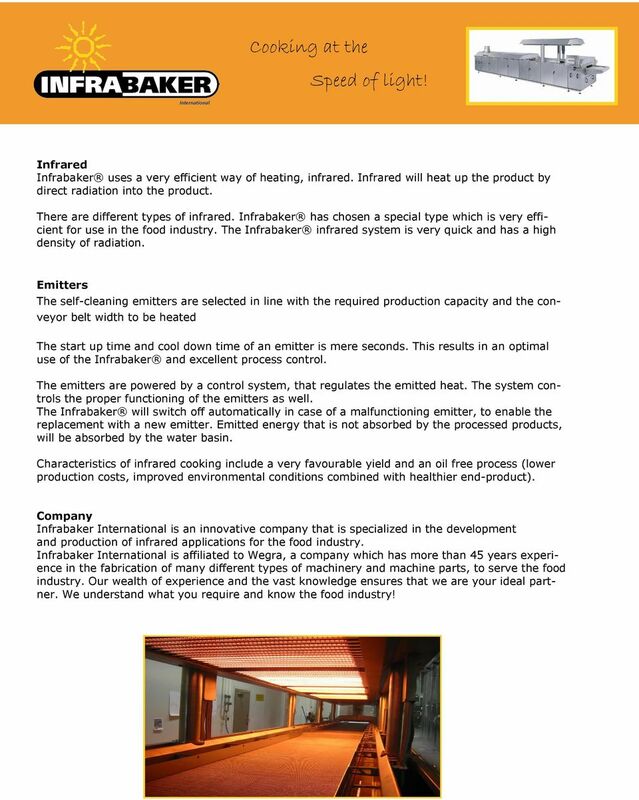 By using its own closed loop air system, the Infrabaker contributes only slightly to process room heating. Infrabaker is easily tailored to customer production volume requirements with multiple processing widths available. Also there are several mesh grades for the conveyor belt available. Quick installation The Infrabaker can be integrated in a production facility quite easily with a minimum of infrastructure requirements. Only a small water supply and electrical supply for the control cabinets are required. 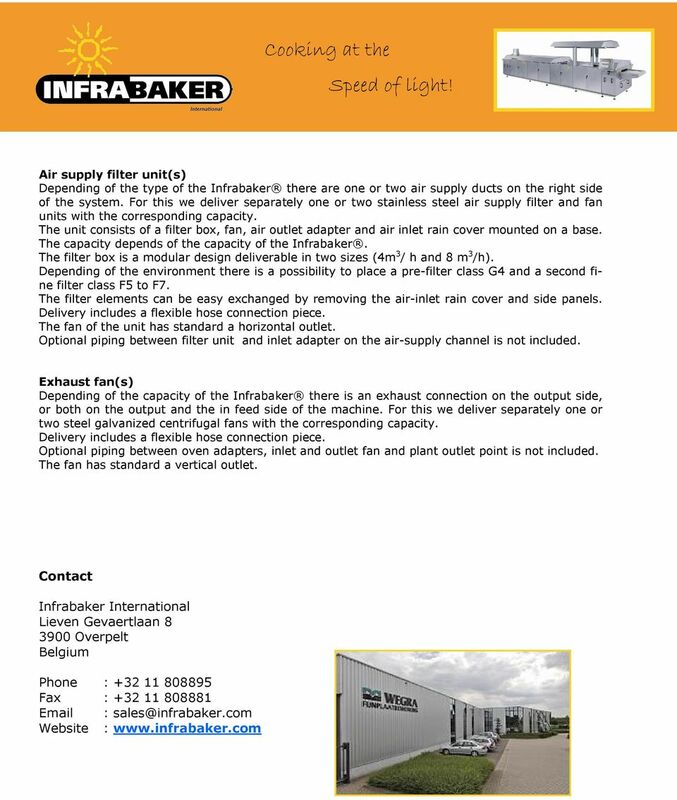 The installation comes with cooling air units and flu gas fans to match the Infrabaker capacity. No installations like thermal oil boilers or fuel supply lines are required with a cutback in plant maintenance to match. 3 Infrared Infrabaker uses a very efficient way of heating, infrared. Infrared will heat up the product by direct radiation into the product. There are different types of infrared. 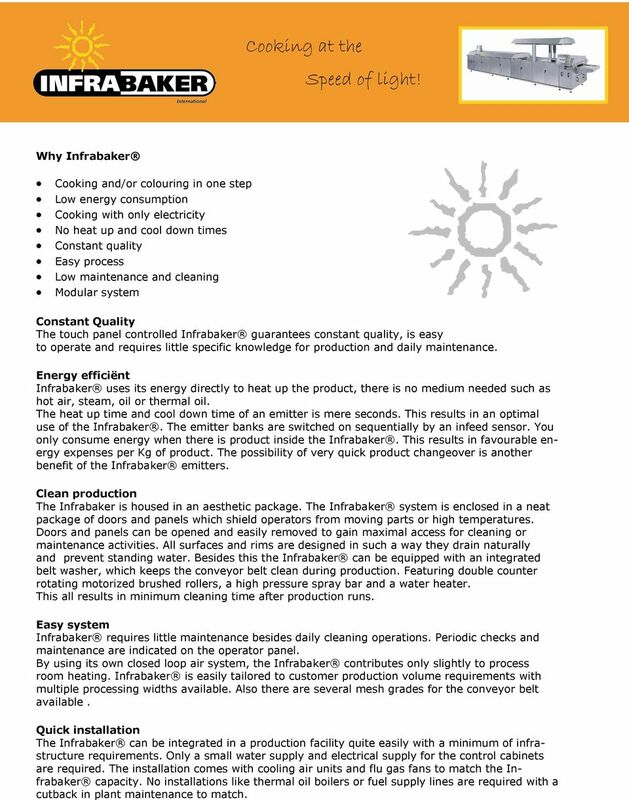 Infrabaker has chosen a special type which is very efficient for use in the food industry. The Infrabaker infrared system is very quick and has a high density of radiation. Emitters The self-cleaning emitters are selected in line with the required production capacity and the conveyor belt width to be heated The start up time and cool down time of an emitter is mere seconds. 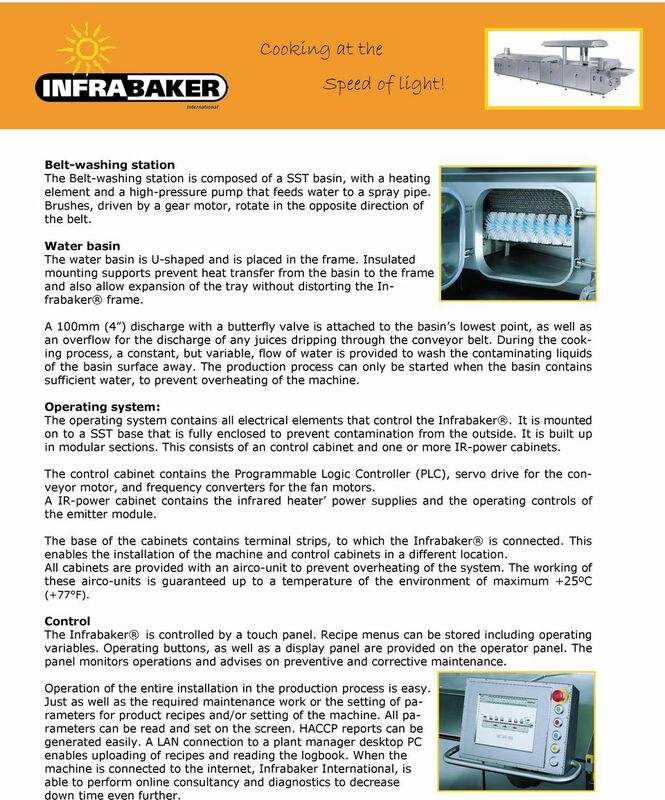 This results in an optimal use of the Infrabaker and excellent process control. The emitters are powered by a control system, that regulates the emitted heat. The system controls the proper functioning of the emitters as well. The Infrabaker will switch off automatically in case of a malfunctioning emitter, to enable the replacement with a new emitter. Emitted energy that is not absorbed by the processed products, will be absorbed by the water basin. Characteristics of infrared cooking include a very favourable yield and an oil free process (lower production costs, improved environmental conditions combined with healthier end-product). Company Infrabaker International is an innovative company that is specialized in the development and production of infrared applications for the food industry. Infrabaker International is affiliated to Wegra, a company which has more than 45 years experience in the fabrication of many different types of machinery and machine parts, to serve the food industry. Our wealth of experience and the vast knowledge ensures that we are your ideal partner. We understand what you require and know the food industry! 4 Cooking at the Details Emitter module Emitter modules are mounted in the top part of the Infrabaker. This module consists of metal sheeting fitted on the outside and a perforated metal sheeting on the inside. The latter is used to mount the emitters to, and to ensure an even distribution of the cooling air supply above the Infrared emitters. The module also houses the emitters electrical connections. Air is supplied by a medium-pressure blower(s) and air filter(s) that come with the installation. The quantity of air can be selected on the control panel; however, a minimum requirement has been set. A flow sensor is installed in the air inlet that will switch off the machine when there is no, or insufficient airflow. The cover can be opened 0.8m (31,5 ) vertically by means of an electrically driven spindle mechanism, providing excellent access to the inside of the Infrabaker. Frame The frame is constructed of Stainless Steel (SST) box profiles and sheet components assembled with welded and screwed joints. 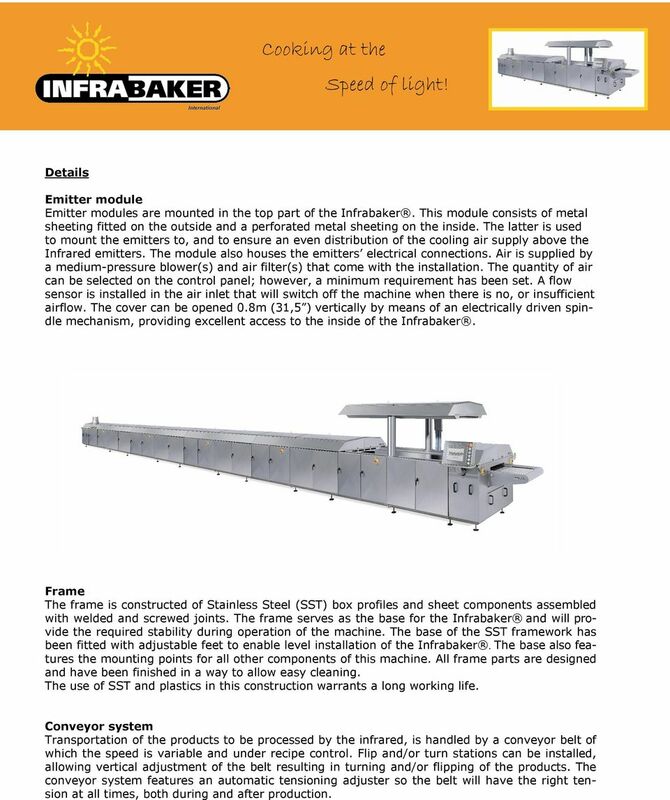 The frame serves as the base for the Infrabaker and will provide the required stability during operation of the machine. The base of the SST framework has been fitted with adjustable feet to enable level installation of the Infrabaker. The base also features the mounting points for all other components of this machine. All frame parts are designed and have been finished in a way to allow easy cleaning. The use of SST and plastics in this construction warrants a long working life. Conveyor system Transportation of the products to be processed by the infrared, is handled by a conveyor belt of which the speed is variable and under recipe control. Flip and/or turn stations can be installed, allowing vertical adjustment of the belt resulting in turning and/or flipping of the products. The conveyor system features an automatic tensioning adjuster so the belt will have the right tension at all times, both during and after production. 5 Belt-washing station The Belt-washing station is composed of a SST basin, with a heating element and a high-pressure pump that feeds water to a spray pipe. Brushes, driven by a gear motor, rotate in the opposite direction of the belt. Water basin The water basin is U-shaped and is placed in the frame. Insulated mounting supports prevent heat transfer from the basin to the frame and also allow expansion of the tray without distorting the Infrabaker frame. A 100mm (4 ) discharge with a butterfly valve is attached to the basin s lowest point, as well as an overflow for the discharge of any juices dripping through the conveyor belt. During the cooking process, a constant, but variable, flow of water is provided to wash the contaminating liquids of the basin surface away. The production process can only be started when the basin contains sufficient water, to prevent overheating of the machine. Operating system: The operating system contains all electrical elements that control the Infrabaker. It is mounted on to a SST base that is fully enclosed to prevent contamination from the outside. It is built up in modular sections. This consists of an control cabinet and one or more IR-power cabinets. The control cabinet contains the Programmable Logic Controller (PLC), servo drive for the conveyor motor, and frequency converters for the fan motors. A IR-power cabinet contains the infrared heater power supplies and the operating controls of the emitter module. The base of the cabinets contains terminal strips, to which the Infrabaker is connected. This enables the installation of the machine and control cabinets in a different location. All cabinets are provided with an airco-unit to prevent overheating of the system. The working of these airco-units is guaranteed up to a temperature of the environment of maximum +25ºC (+77 F). Control The Infrabaker is controlled by a touch panel. Recipe menus can be stored including operating variables. Operating buttons, as well as a display panel are provided on the operator panel. The panel monitors operations and advises on preventive and corrective maintenance. Operation of the entire installation in the production process is easy. Just as well as the required maintenance work or the setting of parameters for product recipes and/or setting of the machine. All parameters can be read and set on the screen. HACCP reports can be generated easily. A LAN connection to a plant manager desktop PC enables uploading of recipes and reading the logbook. When the machine is connected to the internet, Infrabaker International, is able to perform online consultancy and diagnostics to decrease down time even further. AIR COMPRESSORS come with an inflating pistol and gauge for tyre inflation as well as additional accessories for use around the home. machinery projects care diamond series bottle washers double end bottle washers suitable for PET bottles With their multi-tank design, Crown-Baele washers are ideal for cleaning returnable PET bottles.